Photo credit: Eric Millette. A Zest for Bridges: 2012 Award of Excellence Winner Theodore Zoli Zoli designed the Mary Avenue Bridge in Cupertino, Calif., to connect bisected communities. 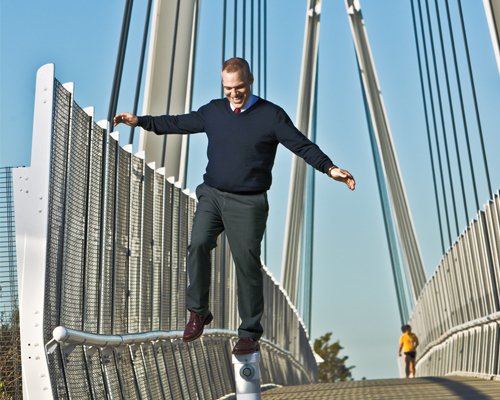 A Zest for Bridges: 2012 Award of Excellence Winner Theodore Zoli. Zoli designed the Mary Avenue Bridge in Cupertino, Calif., to connect bisected communities. One recent Sunday afternoon while he was biking in New York City’s Central Park, Theodore Zoli’s cell phone rang. It was a call from James Ray, a U.S. Army Corps of Engineers senior researcher with the Engineering Research and Development Center in Biloxi, Miss. Troops in Afghanistan were concerned about a bridge that had been damaged by fire. Could they safely cross it? Ray hated to interrupt the notoriously busy Zoli on a rare day off, but he urgently needed an answer. Ray knew he had to call HNTB Corp.’s national chief bridge engineer, known for his work in making structures more resistant to blasts and fires—whether from accidents, terrorism or enemy fire. In fall 2009, the New York State Dept. of Transportation (NYSDOT) had to shut down the Lake Champlain Bridge between New York and Vermont—a lifeline for two communities with no other links within 100 miles. Would it be possible to design a bridge that could be built quickly and economically while also satisfying the communities? NYSDOT officials weren’t sure—until they met Zoli. Zoli’s work has been at or near the center of multiple similar scenarios: on the Mary Avenue Bridge in Cupertino, Calif. (ENR 3/9/09 p. 17); the Happy Hollow Bridge in San Jose, Calif.; the Bob Kerrey Pedestrian Bridge in Omaha; the Blennerhassett Bridge in West Virginia; and the Long Island Rail Road’s (LIRR) Atlantic Avenue viaduct in New York City (ENR N.Y. 11/07/11 p. 84). For these reasons and for his consistent ability to optimize and integrate innovation with practicality as well as his tireless dedication to enhancing the safety and well-being of society in multiple aspects, Engineering News-Record has chosen Zoli as its 2012 Award of Excellence winner. Despite frigid January weather in Portsmouth, N.H., residents came out in droves to an open house to learn about the planned new design for the movable Memorial Bridge across the Piscataqua River. The old truss bridge was an emergency closure. Sporting a close-cropped haircut, glasses, a preppy sweater and tie, the compactly muscled Zoli looked like both an Ivy League professor and the descendent of a blue-collar contractor—and he is both. In professorial tones and layman’s terms, he patiently explained to the audience the reasons for his design of the new lift bridge. The discussion went on for hours. The structure will be the first truss bridge in the world with no gusset plates, using uniform 65-ft metal sections spliced and reinforced by plates. Zoli used cold-bent steel—another first for bridges—and located the machine rooms under the main span. Most attendees seemed pleased by the explanations, and many praised him. But one man demanded to know why the bridge could not be more of a signature bridge. He asked, didn’t Portsmouth deserve its own version of Boston’s Zakim Bridge? Zoli listened attentively, then described the legacy of the original movable bridge’s designer, John A.L. Waddell, and explained how the planned gray zinc coat for the new bridge would be not only the most anti-corrosive but also echo the region’s Navy shipbuilding history. But the man persisted. Gammon says the bridge sections are actually all straight but form the optical illusion of curves. Bids initially came in at $45 million, so the town of Council Bluffs, Neb., and Omaha tried again. With APAC and HNTB, they got the desired bridge at $25 million. But Zoli and the design-build team of Kiewit Constructors and HNTB created an “elegant, simple” design that required only 56 weekends. Crews replaced the upper column portions and installed new bracing, eliminating multiple field splices. A continuous modular beam with disc bearings that acted as in-span hinges created greater flexibility. Zoli’s most critical contributions to New York City aren’t as visible. After the 9/11 attacks, Zoli launched HNTB’s infrastructure security practice and developed a lightweight, blast-resistant composite material that has been applied on eight bridges (ENR 10/5/09 p. 10). “Ted has worked with agencies to determine how we can harden our structures against potential attacks,” says Paul Yarossi, HNTB president. Such work led to his selection as a 2009 MacArthur Foundation Fellows Grant recipient (ENR 10/5/09 p. 10)—the first structural engineer to win the so-called “genius” grant—and his role as an instructor for the Federal Highway Administration (FHWA) bridge and tunnel vulnerability workshop. Zoli is unselfconscious in his desire to be a good global citizen. It shows in small gestures, such as bending the perforation of an Amtrak ticket to help the conductor tear off the stub. He is a godfather several times over. Colleagues note how he always leaves his office door open for them to wander in and out at will. He displays a down-to-earth humor born of growing up as one of five grandchildren of an Italian immigrant-turned-road contractor. Zoli grew up on construction sites in the Adirondack mountains of New York (see p. 60). His blue-collar roots, big family and childhood spent in the mountains have shaped his worldview, which seeks to balance industry and environment, always collaborate and build for the public good. He grew up embracing the process of construction. In Robert Pirsig’s book “Zen and the Art of Motorcycle Maintenance,” the narrator strives for balance between Zen-like “in the moment” romanticism and a rational approach that grasps the mechanics of the practical world. Zoli aims for this balance in his bridges, and—unlike Howard Roark, Ayn Rand’s Objectivist architect whose ego fuels his structures—he believes in collaboration with no ego. There is also a continuum of a history of bridges from which to learn, Zoli believes. “Bridge failures become more precious as they become fewer,” he says. As a visiting lecturer at Princeton University, he speaks of the too-thin gusset plates and the lack of redundancy that led to the Minnesota bridge collapse in 2007 from multiple factors. “We’re missing the important lesson: The connections should not have failed. We have not come to grips yet with the intrinsic flaws in our industry. It should not be about fracture-critical but about failure-critical,” he observes. That quality—combined with a preference for simple solutions over polished product and an appreciation of the messy process and the imperfections—as long as they are not dysfunctional—has not always pleased everyone. Renowned Swiss engineer Christian Menn had worked with Zoli and others on the Zakim Bridge in Boston; Menn was the conceptual designer. When asked to do the same for the Streicker Bridge at Princeton, he asked Zoli to be the engineer-of-record. “Ted made some decisions on his own, and Menn was rightfully upset,” says David Billington, a professor emeritus at Princeton who has written books about Menn and the Swiss engineering legacy. Zoli strove to retain the striking, slender, converging geometry of the bridge, but his economics-driven engineering changes included light poles, bent and tilted I-sections for the railing, and a truss system of weathered leftover steel rather than precise sections. One of the new materials is black locust wood, the main component of Zoli’s 400-ft-long Squibb Park footbridge in Brooklyn. Curving between trees and buildings and over streets, the bridge will use the wood as a durable, eco-friendly, context-sensitive material and connect with a new park designed by landscape architect Michael Van Valkenburgh. Zoli also is exploring new materials in the name of public good using the five-year MacArthur grant of $500,000. His three projects involve disaster-relief structures: lightweight shelter roofs, extensions to temporary bridges and, in Morocco, a 175-ft-long synthetic rope bridge to be built this year. The goal is to build post-disaster structures quickly, with easily transported materials. Columbia University students will build the bridge as part of Engineers Without Borders. Zoli’s embrace of non-conventional projects “is the hallmark of a game-changer,” adds Nina-Marie Lister, a planner and adviser to Animal Road Crossing, a coalition that held an international competition in 2010 to design an innovative wildlife crossing at Colorado’s West Vail Pass along I-70. Potential jurors needed to be collaborative and to truly appreciate the problem. Zoli was again motivated by a Buddhist sense of nature, honed further by his visits to his surrogate family in Taiwan, combined with the desire to solve a practical problem. He notes that wildlife highway accidents cost $8 billion a year in claims and injuries to humans and bemoans animal deaths. “As drivers, we lost sensitivity to the fact that animals belong in these areas. We got into the idea that this was OK,” he says. Never has the newlywed been busier. “I once sat next to Ted on a flight to San Diego from Newark,” recalls Van Valkenburgh. “I am a bit of a workaholic, but he did so much work on this flight that I felt exhausted just sitting next to him!” Things might only get more intense: Zoli and HNTB are now on one of the teams vying for the Tappan Zee Bridge rehabilitation. “What I appreciate most about his maturation is, he’s finally figured out how to empty his voice mail on his cell phone,” jokes David Goodyear, senior vice president with team member T.Y. Lin International.